YOUR CAT COULD BE FEATURED HERE NEXT MONTH! I can't keep a straight face when I look at pictures of cats. If you're like me, you're either smiling at their sweetness or laughing at their antics. Do you love watching cats being funny? I have done my best to choose genuinely funny cat videos for your enjoyment. Do you favour a particular breed or a regular non-pedigree? My family has one of each - a Burmese and a non-pedigree Tabby. They are both an absolute delight and give every family member immense pleasure and amusement. If you love cats, I hope you'll love this website. It's full of what we love about cats with lots of pictures of cats to curl the sides of your mouth. 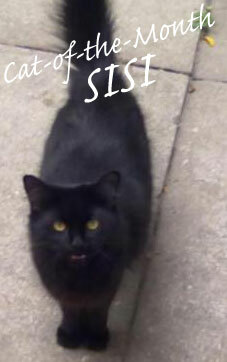 Sisi (pictured above) is our Cat of the Month. How would you like to see your cat featured on our home page (this page) for a month? This website receives about 28,000 visitors every month from all around the world, and you can show your family and friends. To enter, go to the Cat of the Month page to upload a good photo and tell us about your cat. The best entry will be selected after the 25th of each month to be featured on this page the following month. Entries not selected for cat of the month will get their own page on this site featuring the cat's photo and story.